THIS DRAWING AND THE INFORMATION IT CONTAINS IS TO BE USED AS A REFERENCE ONLY. GOLD COAST 2018 COMMONWEALTH GAMES CORPORATION MAKES NO REPRESENTATION OR WARRANTY AND ACCEPTS NO RESPONSIBILITY OR LIABILITY FOR THE SUITABILITY, COMPETENCY, ACCURACY, CURRENCY OR COMPLETENESS OF THIS DRAWING OR THE INFORMATION IT CONTAINS. ALL LEVELS AND DIMENSIONS MUST BE VERIFIED BY CONTRACTORS AND SUPPLIERS ON SITE AND ANY DISCREPANCIES ARE TO BE REPORTED TO GOLD COAST 2018 COMMONWEALTH GAMES CORPORATION BEFORE PROCEEDING WITH ANY WORK ON SITE. ALL DRAWINGS, INFORMATION AND SPECIFICATIONS ARE THE PROPERTY OF GOLD COAST 2018 COMMONWEALTH GAMES CORPORATION AND ARE NOT TO BE DISTRIBUTED, REPRODUCED OR ALTERED IN ANY WAY WITHOUT WRITTEN PERMISSION. THIS DRAWING AND THE INFORMATION IT CONTAINS IS TO BE USED AS A REFERENCE ONLY. GOLD COAST 2018 COMMONWEALTH GAMES CORPORATION MAKES NO REPRESENTATION OR WARRANTY AND ACCEPTS NO RESPONSIBILITY OR LIABILITY FOR THE SUITABILITY, COMPETENCY, ACCURACY, CURRENCY OR COMPLETENESS OF THIS DRAWING OR THE INFORMATION IT CONTAINS. ALL LEVELS AND DIMENSIONS MUST BE VERIFIED BY CONTRACTORS AND SUPPLIERS ON SITE AND ANY DISCREPANCIES ARE TO BE REPORTED TO GOLD COAST 2018 COMMONWEALTH GAMES CORPORATION BEFORE PROCEEDING WITH ANY WORK ON SITE. ALL DRAWINGS, INFORMATION AND SPECIFICATIONS ARE THE PROPERTY OF GOLD COAST 2018 COMMONWEALTH GAMES CORPORATION AND ARE NOT TO BE DISTRIBUTED, REPRODUCED OR ALTERED IN ANY WAY WITHOUT WRITTEN PERMISSION. Beach Patrol Tower THIS DRAWING AND THE INFORMATION IT CONTAINS IS TO BE USED AS A REFERENCE ONLY. GOLD COAST 2018 COMMONWEALTH GAMES CORPORATION MAKES NO REPRESENTATION OR WARRANTY AND ACCEPTS NO RESPONSIBILITY OR LIABILITY FOR THE SUITABILITY, COMPETENCY, ACCURACY, CURRENCY OR COMPLETENESS OF THIS DRAWING OR THE INFORMATION IT CONTAINS. ALL LEVELS AND DIMENSIONS MUST BE VERIFIED BY CONTRACTORS AND SUPPLIERS ON SITE AND ANY DISCREPANCIES ARE TO BE REPORTED TO GOLD COAST 2018 COMMONWEALTH GAMES CORPORATION BEFORE PROCEEDING WITH ANY WORK ON SITE. Existing THIS DRAWING AND THE INFORMATION IT CONTAINS IS TO BE USED AS A REFERENCE ONLY. GOLD COAST 2018 COMMONWEALTH GAMES CORPORATION MAKES NO REPRESENTATION OR WARRANTY AND ACCEPTS NO RESPONSIBILITY OR LIABILITY FOR THE SUITABILITY, COMPETENCY, ACCURACY, CURRENCY OR COMPLETENESS OF THIS DRAWING OR THE INFORMATION IT CONTAINS. ALL LEVELS AND DIMENSIONS MUST BE VERIFIED BY CONTRACTORS AND SUPPLIERS ON SITE AND ANY DISCREPANCIES ARE TO BE REPORTED TO GOLD COAST 2018 COMMONWEALTH GAMES CORPORATION BEFORE PROCEEDING WITH ANY WORK ON SITE. 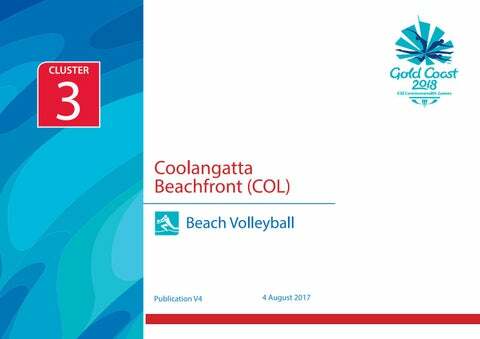 ALL DRAWINGS, INFORMATION AND SPECIFICATIONS ARE THE PROPERTY OF GOLD COAST 2018 COMMONWEALTH GAMES CORPORATION AND ARE NOT TO BE DISTRIBUTED, REPRODUCED OR ALTERED IN ANY WAY WITHOUT WRITTEN PERMISSION.